Lagoon on Mike Island in Wax Lake Delta. Willow tree and wetland plants in Wax Lake Delta. 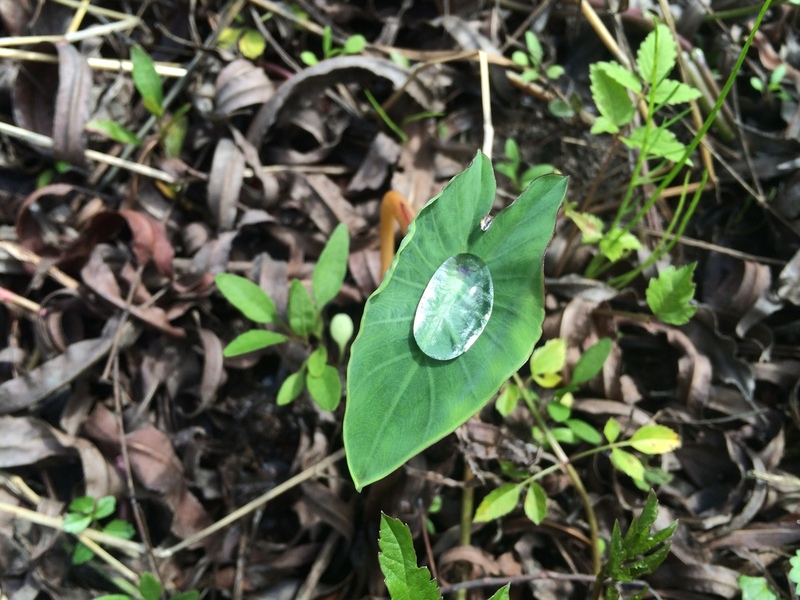 Large water droplet on a wetland plant leaf. Natural levee around perimeter of Mike Island. Southern Louisiana formed and grew over six thousand years by the power of the Mississippi River. After the Great Flood of 1927, much of the lower Mississippi River was leveed to alleviate flooding concerns. Without the sediment carried by the Mississippi River, coastal land is now eroding and sinking, threatening our communities and our way of life. But the story does not end here. 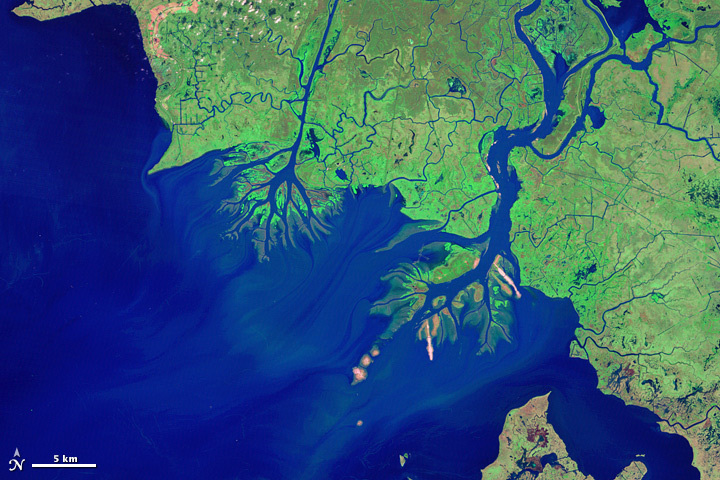 At the end of the Atchafalaya River, a new delta is growing. The Wax Lake Delta. 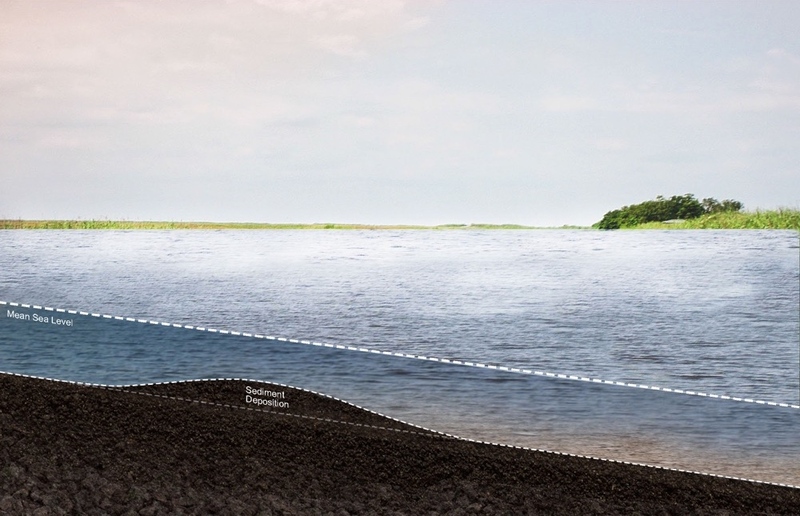 As a “living laboratory”, scientists are studying this newly formed land to understand how deltas grow. 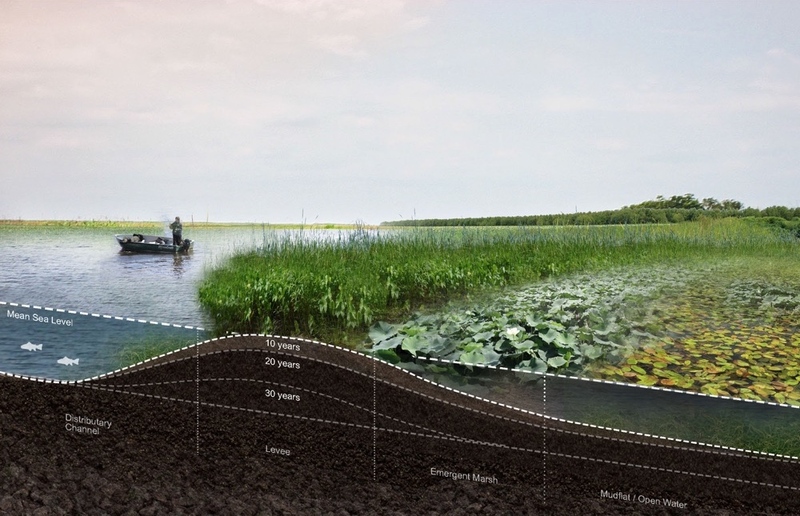 Their findings are providing insight into ways that we can use the Mississippi River to once again build new land throughout Southern Louisiana. Through a happy accident, the Wax Lake Delta is born. In 1941 the U.S. Army Corps of Engineers dug a flood relief outlet from the Atchafalaya River that extended out to the coastline. This outlet provided a constant flow of water to be diverted from the River before reaching the banks of Morgan City, which had experienced several devastating floods. 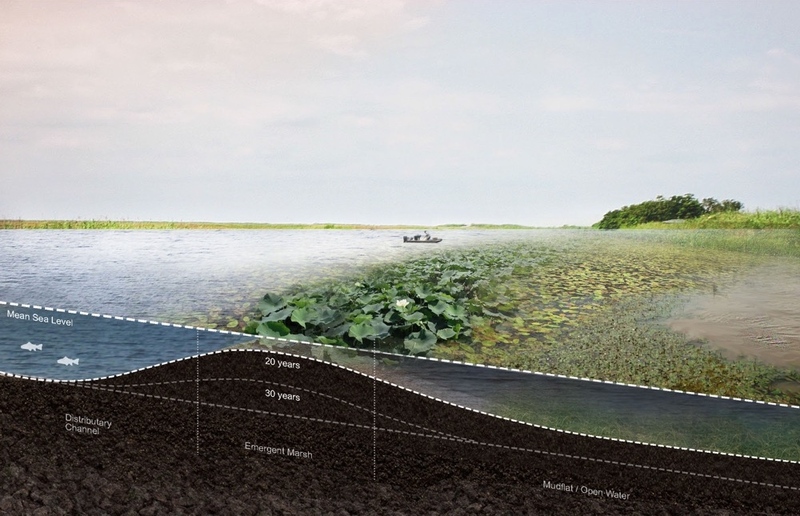 The Wax Lake Outlet was designed to divert 30% of the flow from the Atchafalaya River, and has the capacity to carry a maximum of 440,000 cubic feet per second. Wax Lake Delta October 1, 1984. Wax Lake Delta January 8, 1986. Wax Lake Delta November 24, 1987. Wax Lake Delta April 20, 1989. Wax Lake Delta November 2, 1991. Wax Lake Delta April 13, 1993. Wax Lake Delta February 28, 1994. Wax Lake Delta July 25, 1996. Wax Lake Delta November 11, 1999. Wax Lake Delta April 8, 2001. Wax Lake Delta May 25, 2004. Wax Lake Delta December 21, 2006. Wax Lake Delta August 3, 2007. Wax Lake Delta December 27, 2009. Wax Lake Delta July 27, 2011. Wax Lake Delta November 6, 2014. Following the creation of the Wax Lake Outlet, the turbulent flow of water began to carry sediment down the outlet, which was promptly deposited at the mouth of the outlet. 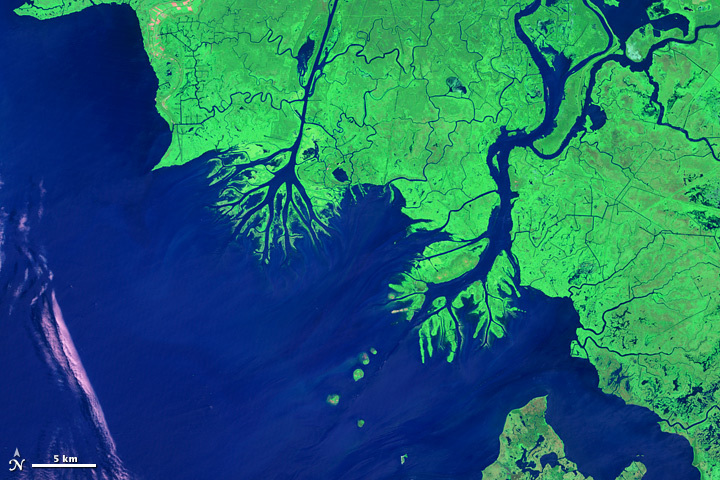 As regular life carried on, no one realized that an underwater delta began to grow near the coast. However, in 1973 an unusually cold winter coupled with high spring rains caused the Lower Mississippi River and Atchafalaya River to rise to flood levels for several months. Though this infamous flood brought much destruction to the region, the high flow of the river carried a tremendous amount of sediment down through the Wax Lake Outlet. Following the 1973 flood, it was first observed that visible land had broken the surface of the water near the mouth of the outlet. This new land, now called the Wax Lake Delta, continued to grow naturally over the next few decades. 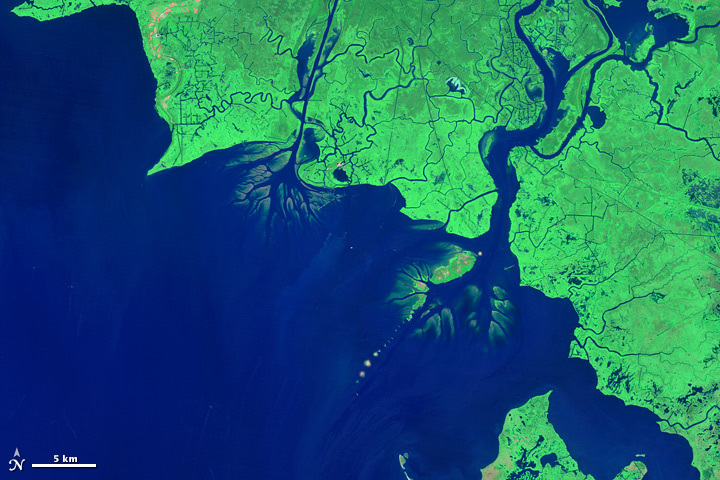 As the land grew in area and in height, plants and trees began to colonize the delta. Today the wetlands and willow trees within the delta provide valuable habitat for a variety of animals. 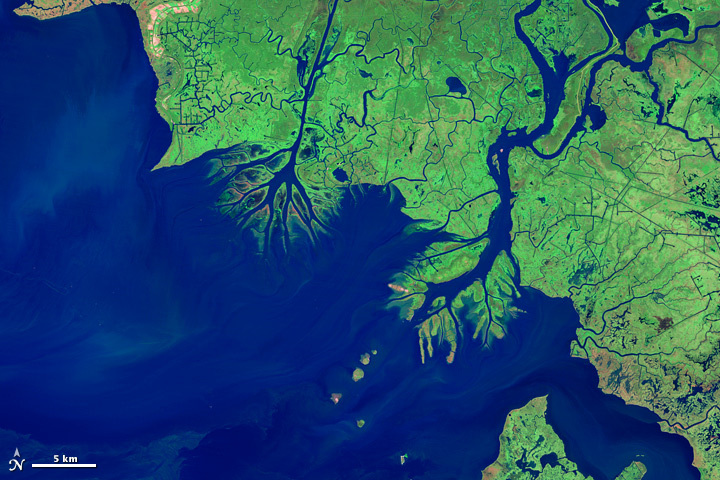 While most of Louisiana is experiencing coastal land loss, Wax Lake Delta is a place where land growth is occurring. Follow researchers as they follow the growth of this area. 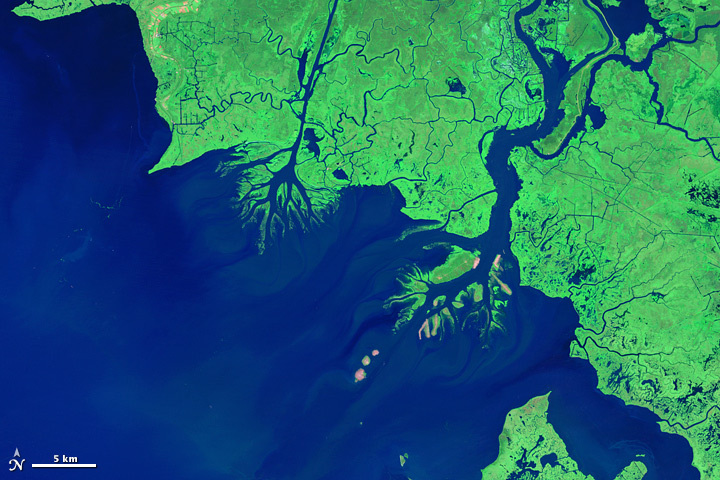 Scientists are studying the Wax Lake Delta to learn how natural, self-maintaining deltas grow and evolve into healthy and mature ecosystems. Because most deltas were formed hundreds or thousands of years ago, it is a rare opportunity that in today’s world we are witnessing the growth of a brand new delta. 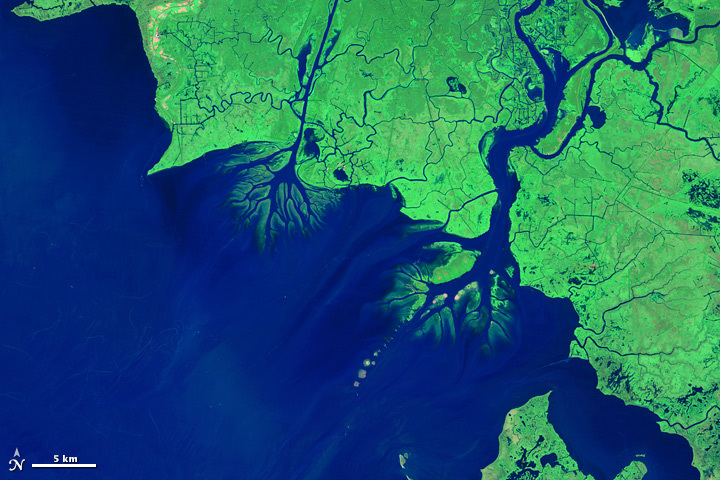 By studying Wax Lake Delta, we will have a better understanding of the natural delta systems, and this knowledge can be applied to efforts to restore the Mississippi River Delta. The state of Louisiana is proposing to allow the Mississippi River to flow in specified areas, so that sediment can once again be distributed throughout coastal Louisiana to create new land. 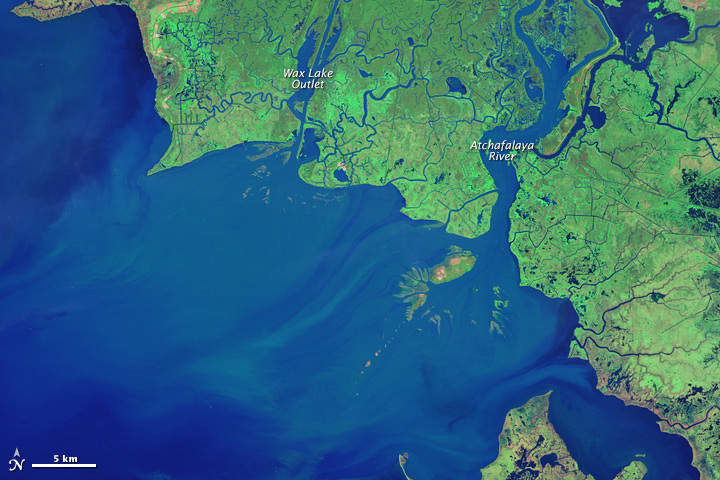 Imagine a hurricane is barreling toward the shores of Louisiana and you are a scientist studying the Wax Lake Delta. You want to understand if the hurricane is going to significantly alter the delta. 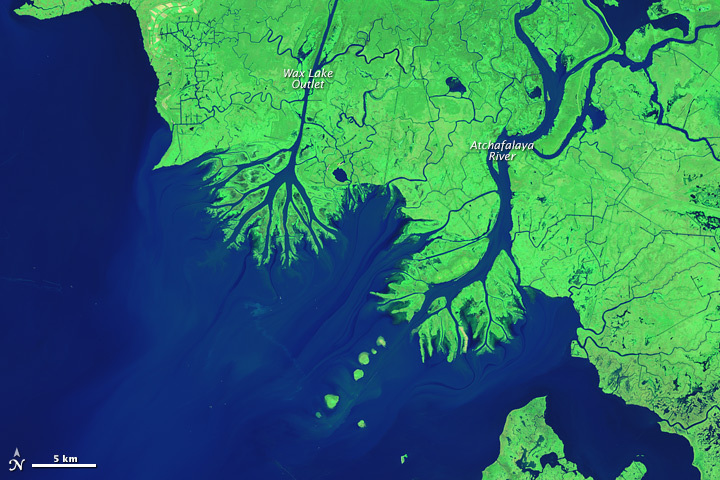 Will the hurricane destroy the land that has been building at the delta’s edge? Will the hurricane bring salt water to the delta and kill the freshwater plants that cannot tolerate salt? 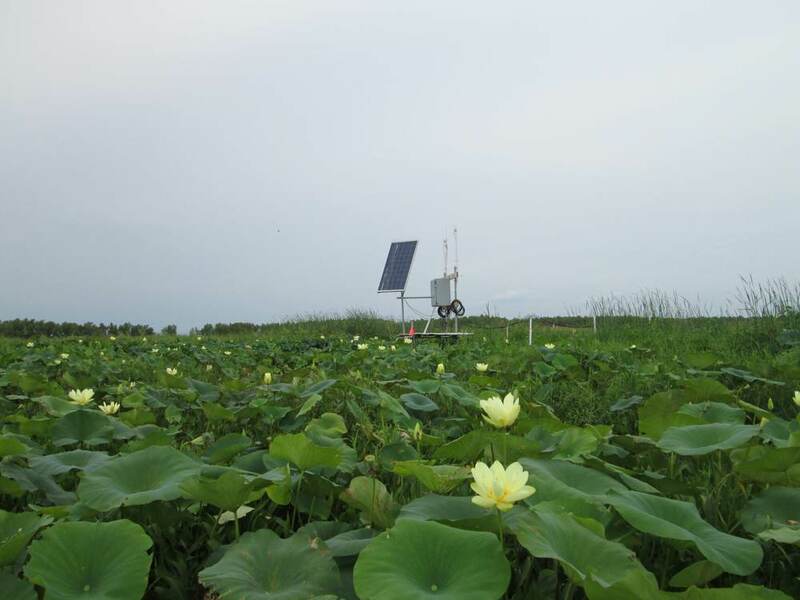 To study the constantly changing conditions at Wax Lake Delta, scientists use specialized equipment that automatically measures properties of water and weather. By placing equipment in different areas on one of the delta’s islands, the network of devices called the "Wax Lake Delta Observatory” is a powerful tool to understand the important factors and processes that influence the delta. Just like a TV can be programmed to record shows at specific times, the equipment is programmed to take measurements every 15 minutes and effectively “monitor” environmental conditions. 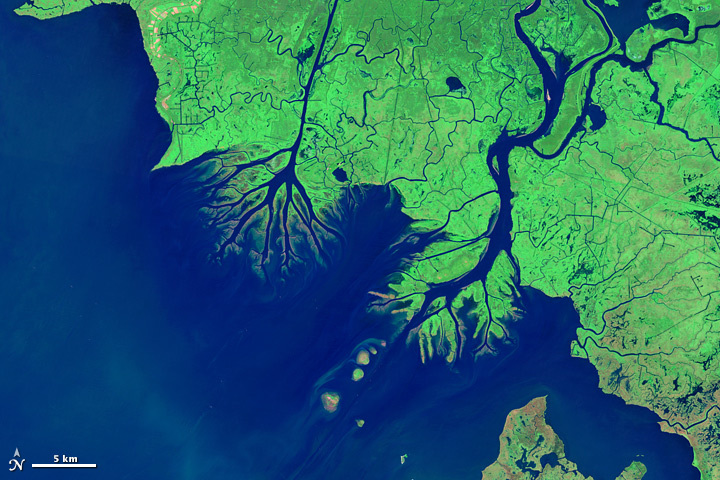 This continuous monitoring allows scientists to capture the effects that storms, changing seasons, river floods, and climate change have on the delta.